We make it easy for you to keep your content up to date with our EZ-CMS Content Mangement System. Add and edit website pages, photos, images, links and multimedia, no coding skills required! Having an up-to-date website for your business is one of the most important tools for success. Content needs to be regularly updated and enhanced to keep customers engaged. We offer the option of updating your website or having one of our web design specialists do the work for you. Manage your own website with our EZ-CMS content management system! Build your own navigation menus, contact forms, and more! If you can type, you can run this system! We make it easy for you to keep your content up to date, add new information, manage user settings and assign rights to specific areas of your site. Just open a web browser, log in to your site, and click to get to the area you want to edit. It's just like using a word processing program! EZ-CMS is specifically designed for people with little to no technical knowledge while still offering advanced features. More features and modules are available - and if we don't already have what you need, let us build you a custom module to fit your exact requirements! Drag and drop photos from your computer and organize your photos into categories and albums. Add captions, create slideshows, and more! Create event calendars, choose your own colors and icons! Add special announcements and banners to different sections of your website. Add and edit your website pages - no HTML experience required! Easily upload files with our drag and drop interface. Create your own custom contact forms for customer feedback, event registrations, service requests - anything you need! Build your own custom navigation menus. Create HTML email newsletters and send them to your subscribers! Keep your users up to date with the latest news. Engage your users with polls and collect valuable data for your business. 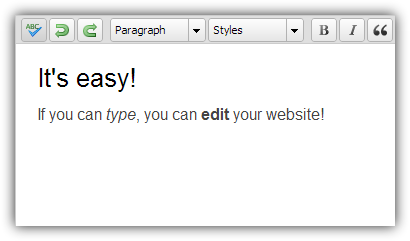 Easily configure EZ-CMS features, fonts and colors, page templates, and more. Allow specific parts of your website to be viewed or edited by different people using role based permissions or user-specific access rules.